Most Indian Railways coaches (AC/ Non-AC) are Self-Generating (SG) types where the electrical power is derived on a standalone basis from Alternators driven by Axle through V belt drive as long as the coach is moving at maximum full load output (MFO) speed of Alternators. However, when the coach is stationary or moving at lower than MFO speed, the entire coach's electrical load (including AC load in case of AC coaches) is met by a battery. The battery is fitted in a battery box underneath the coach. In this application the battery performs in a dusty atmosphere, moderate to high vibration, varying temperatures, restricted time of checking/maintenance and in a continuous charge-discharge mode. 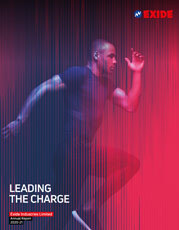 It is the ultimate test of performance and life of a battery where reliability is of utmost importance. Exide, with its full range of batteries for this application starting from 120Ah to 1100Ah capacity - both Low Maintenance (LMLA) and Maintenance-Free (VRLA) types - is one of the largest suppliers to Indian Railways for the Train Lighting and Air Conditioning application. Exide's maintenance free range of VRLA batteries for Railway applications come in 2V single cells assembled in modular racks. These racks are mounted horizontally and can be stacked one above the other. These batteries come in factory-filled charged and ready to use condition. 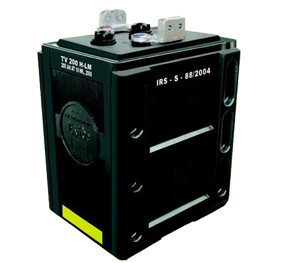 These special railway application batteries are designed differently from conventional lead-acid batteries in order to provide maintenance free operation envisaging Indian Railway's extreme hazardous operating conditions. In normal use these batteries will not release Hydrogen & Oxygen gases, will not release acid mist and will not spill acid. Thus these batteries are inherently safer than conventional lead acid batteries. 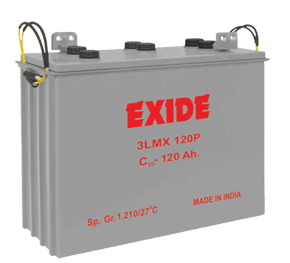 The VRLA batteries manufactured and supplied by Exide Industries Ltd. conform to ROSO's specification: RDSO/ PE/ SPEC/ D/TL/ 0009-2008 (Rev1) with amendment No.1 latest amendment (for sealed maintenance free lead acid batteries for Trainlighting and airconditioning coaches). Large diesel engine starting in railway locomotives is a unique application and it differs greatly from starting engines of small combustion volumes such as cars and trucks. The difference lies in the heavier weight of moving parts and higher resistance of piston motions in cylinders. While starting a diesel loco engine, the starter battery needs to provide power to perform several pre-start functions such as powering up hydraulic pumps, air compressors, brake systems etc., mandatory for smooth engine starting without any damage to engine components. As such, battery gets partially discharged before actual cranking of the engine. 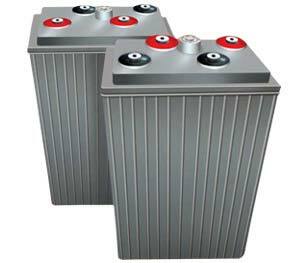 Robustness of design is therefore of utmost importance for the battery used for diesel engine starting application. Exide's Low Maintenance Tubular diesel engine starting batteries of capacities 290, 450 and 500AH are the first choice of Railways due to their unparalleled performance and longevity. The Electric Multiple Units (EMU) are a part and parcel of suburban India and the lifeline for millions of commuters every day. Also, use of Electric Locomotives is increasing with increased railway electrification. Both EMU Coaches and Electric Locomotives run on the electric power supply available from the overhead grid and power transmitted through the roof-mounted pantograph. To energize the equipment from disconnected situation (when the Loco/ EMU is in Car Shed), independent power supply from a battery is required to lift and connect the pantograph to the grid. Also, in case of an emergency, battery power is used for braking. 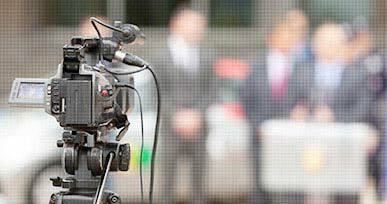 The reliability of battery is therefore very important as the starting operation of the equipment depends on it. Exide's 10V 75 and 90AH Low-maintenance tubular batteries have been the preferred choice of Railways for EMU and Electrical Locomotive applications over the years. Signalling infrastructure is by far the most critical area of railway movement as major part of railway safety is dependent on the robustness and reliability of the signalling equipment and nothing less than 100% fail-safe mechanism is adopted. Railway Signalling is a complex arrangement and the most important aspect of the entire scheme is providing continuous power supply to the signalling equipment with continuous robust and reliable power back up. Battery, therefore, is an integral part of the signalling infrastructure to provide backup power and keep the signalling system operational in case of any interruption/ breakdown in Mains power. To cater to the needs of the application, more often than not signalling batteries are to be installed in rather difficult environmental conditions - remote locations, beside railway tracks under hot and humid ambient conditions, exposed to dust and vibrations etc. For major part of its network, Indian Railways has its own telecommunication systems to ensure uninterrupted channel of communication for smooth running of its vast logistics operation. This system also uses batteries for backup power. Needless to mention that the batteries used for S & T application have to have highest degree of reliability. 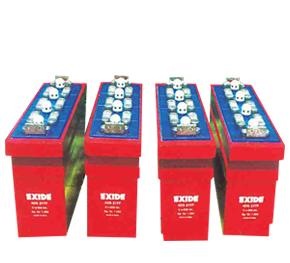 Exide manufactures and supplies wide range of batteries from 40AH to 500AH - both low maintenance tubular and maintenance-free types to Indian Railways for S & T application. These batteries have a proven track record of long life and best performance. 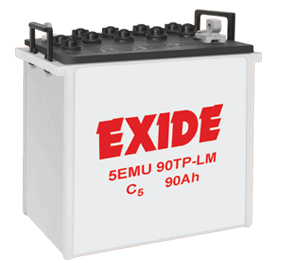 **All Exide batteries are approved by RDSO as per the latest specifications.